I am indeed delighted to be given the opportunity to address you tonight on this special occasion and to be among a group of distinguish individuals. Tonight we are witnessing the transition of one leadership team handing over to another. The changing of the Guards! It is also a special moment for me because it was just a mere 9 days ago I was officially informed that I am part of a “changing of the Guards” as I was promoted to act in the position of Deputy Commissioner of Police. Tonight I am delighted to share this moment with the Rotary Club. With your permission Mr. Chairman I would like to express gratitude to those in authority who placed that confidence in and will like to assure them that I am committed to the task ahead. I would also like to take this opportunity to say a special thank you to one of my biggest supporters along my career journey; my wife. She is a woman of faith, courage and determination and has been there for me in the difficult times and the good times…I say thank you! Tonight I have selected a theme for our consideration and it’s “Aspire to Serve”. As a service organization the word “serve” is common to each member. The questions are how is your service demonstrated? How effective are you as you strive to show the community that you care? How are you making a difference? How committed are you to the club? What is the evidence that you are true to the Motto “Service above self”? The American Preacher John Hagee once said “The measure of a man’s greatness is not the number of servants he has but the number of people he serves”. 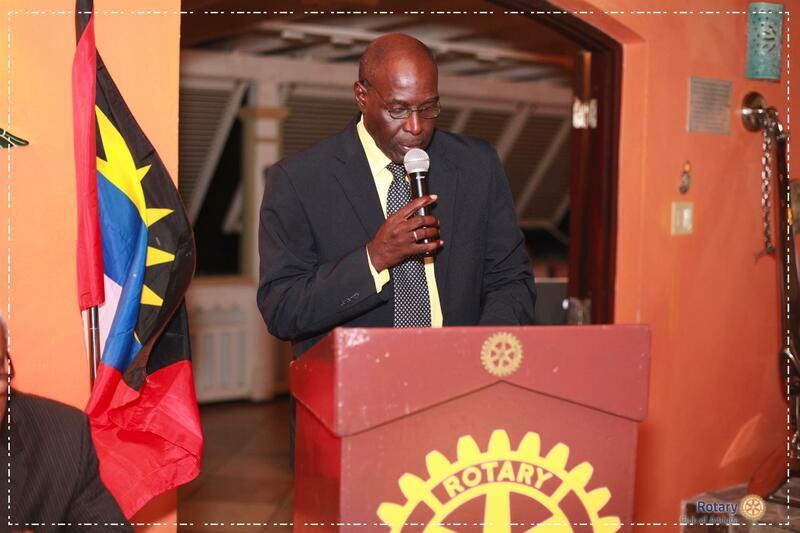 As we move from one presidency to a next the overall goal the Rotary Club of Antigua remains the same …to serve humanity especially within the borders of Antigua and Barbuda. Serve in an acrostic format and let us be motivated by the significance of each letter. S- Seek – Seek opportunities – There are great needs in our communities in the areas such as Health, education, economic empowerment and Peace. The field is white and the harvest is ready but the workers are few. Investigate the needs, seek information, and identify what is in your domain and in your power to tackle. E- Engage- collaborate and cooperate with other like minded people and build relationships to allow you to achieve your goals. Connect with those in need and those that can assist you in meeting the needs. There is still value in unity as we are aware that 1 plus 1 equal 3 (1+1=3) and team work will divide the task and multiply the success. R- Resourcefulness- In these difficult economic times if you are to fulfill your mandate to provide service to humanity, the leadership of the club along with each member must be creative and tap into the limited resources available. It may call for some critical thinking and being innovative, all in an effort to make a difference in the lives of others. At the same time you are expected to be wise and flexible with what you have. Most of you here are in the business sector therefore this is what you live and do daily, making adjustments to realize profits. I urge you to bring these same principles to the activities of the club. V- Visionary – So often we are reminded of the phase “where there is no vision the people perish”. As you make the transition of Power, the new leader must be visionary in his approach. You are expected to look ahead at your tenure in office, analyze the opportunities and challenges and develop strategies that will enable you to achieve your set goals. Dream Big but set SMART goals and create a road map to attain your objectives. E- Energetic- If you are to portray yourself as a vibrant service organization, laziness and complacency will not assist you. A demonstration of energy, vibrancy and a passion to get the job done will show this community that the Rotary Club of Antigua is a group of hard working men and women who do not get weary in well doing but goes the extra mile every time with an energetic attitude that cannot be explained. Solving real problem takes real commitment, hard work and full energy. That energy level must not only be seen in the president and the Leadership team but in every Rotarian. Seek Opportunities, Engage others, be resourceful, have a vision and be energetic you would have truly exhibited the evidence that you are a vibrant, viable and valuable service organization in our Twin Island State. Your theme of making a difference in 2017-2018 would not just be another catchy phase but one that will bring positive change in the lives of individuals. I am convinced that this club remains an essential component in our nation’s development. I am confident that lives of individuals and communities can be improved by your efforts. You stand on a reach history of over 40 years of existence and over 40 past presidents. Therefore I am confident that the Club is mature, experience and has the caliber of members that can really make a difference in the lives of persons in 2017-2018 and beyond. To the outgoing President I would like to place on record my gratitude and appreciation for your commitment and dedication during your tenure in office. Like any other leader before you there must have been challenges, distractions, obstacles but you endured to the end and I commend you for your contribution to the Club and by extension to Antigua and Barbuda. To the outgoing executive Board your contribution to the Club is greatly appreciated and we applaud you for volunteering your time, energy, resources and skills in serving humanity. To the incoming President, being the 45th President may not be a popular title in the USA today, but in the Rotary Club of Antigua you can demonstrate your skills and talent and be a successful 45th president. As you assume that responsibility let me encourage you with the words of Robert MacArthur the Canadian born Ecologist, who once said “a true leader has the confidence to stand alone, the courage to make tough decisions and the compassion to listen to the needs of others”. To you the supporting Cast of the president Elect, I urge you to foster the principles of unity. Create a cohesive unit and work together towards the same goals. Be reminded that leadership is not just a position but actions, actions that enhance the Club and transform the lives of others. I extend best regards to the entire team (Board) as you start you tenure. We within the Royal Police Force of Antigua and Barbuda are committed to support your efforts and to provide any assistance to you during your tenure in office in activities and plans where the services of the Police Force are needed. Rotarians you have done great work internationally, regionally and on the local scene. You are a global network of 1.2 million neighbors, friends, leaders, and problem-solvers who come together to make positive, lasting change in communities here in Antigua and Barbuda and around this Globe. Congratulations to you for your continued commitment to the improvement of lives. As you continue the journey, may I encourage you to aspire to serve more than before, in more areas and with more vigor. It is much more than wearing a Pin and making public appearance. It’s staying loyal to the motto of your organization, by attending your meetings, by performing your roles, by getting the job done well, by impacting the lives of others in a positive way and yes wearing your pin with pride as a member of this prestigious group…As you do…. Endure to the end…..The race is not for the swift but those who endured to the End. Be constantly reminded of the words of the famous Civil Right leader Martin Luther King “Every man must decide whether he will walk in the light of creative altruism or in the darkness of destructive selfishness”. Ladies and Gentlemen as I conclude let me say once again thank you for this opportunity to share this special moment with you and as I strive to stick the rules of Stand up…Speak up…Sit down…I wish the leave with you the words of this poem written by Catherine Pulsifer a motivational and inspirational author. May God bless your efforts as you aspire to serve and enhance the lives of people while making a positive difference in their lives, then you would have provided service above self!